As SovereignMan.com's Simon Black notes, that’s more than the estimated $1.3 trillion in direct costs that the government spent fighting the War in Iraq. What’s probably even more bizarre is that the US government actually owns about 70% of those student loans– a total of $1.06 trillion. I discovered this over the weekend when I was reviewing the federal government’s recently published financial statements for fiscal year 2017. 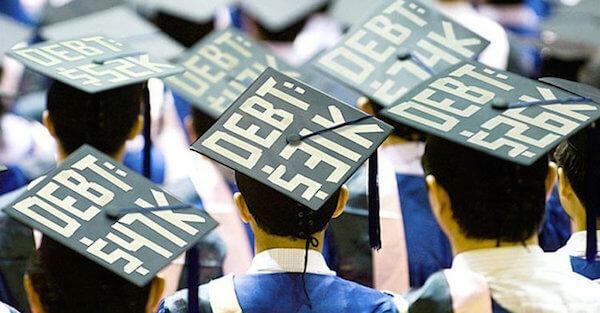 Student loans actually constitute the #1 asset of the US federal government, comprising about 30% of its balance sheet. In other words, young people of America owe more money to the federal government than the value of every tank, every bullet, every aircraft carrier, every acre of land in the national parks. That’s a pretty sad statement to make. And remember that student debt in America is a very special kind of debt: it chases you around forever. Thanks to a piece of legislation signed into law by Bill Clinton in 1998, student debt is almost impossible to ‘discharge’. 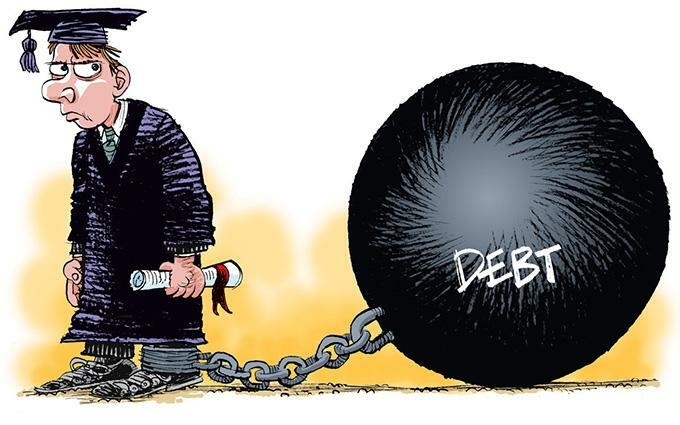 So unlike just about every other type of debt like a home mortgage or medical debt, student debt is extremely difficult to wipe away through bankruptcy procedures. It’s more a form of indentured servitude than it is debt. There’s no escape. To me, this really calls into question the long-term value of a university education. Now, there’s a lot of data on this topic, and it’s all over the board. A 2016 study in the United Kingdom by the Institute of Fiscal Studies, for example, showed that median salaries for graduates at several dozen universities were lower than non-university graduates. On the other hand, researchers from the Federal Reserve Bank of New York have argued that university graduates will earn, on average, $1 million more over their lifetimes than people who do not graduate from university. This is what they call the ‘wage premium’ of a university degree. But even their own data shows that this wage premium is falling. Another study from the UK’s Warwick University in 2012 calculated that a university graduate’s wage premium had fallen 22% in a decade. Factoring in the steep cost (and stress) of student loans, university is not an obvious choice anymore. More importantly, student debt can really limit a young person’s options. When you’re staring down the barrel of $50,000 owed to the federal government, you don’t have the luxury to take a year off, travel the world, and learn a foreign language. Or to NOT take a job and start a business. Or to take a lower paying job where you’ll learn more. You’re relegated to the first available option that pays down the most debt. And that certainly has a long-term impact. And as Mauldin Economics' Patrick Watson notes, this might be okay if the debt enhanced the student’s financial security, but for millions of Americans, that’s not what has happened. Borrowers don’t achieve the desired results but remain stuck with the debt anyway. While delinquency rates for other forms of debt fell after the recession, student loans didn’t. As of year-end 2017, about 11% of nearly $1.4 trillion in student debt was at least 90 days delinquent. Roughly half of student debt is held by borrowers who aren’t required to make payments yet. That’s because they are still in school, unemployed, or otherwise excused. Much of that debt would likely be delinquent too. Also important: The delinquent loans tend to be small (less than $10,000) and held by borrowers who never earned degrees. These borrowers probably thought they were doing the right thing. They wanted decent jobs and saw that having a college degree was necessary to get one. So why is college the key to gainful employment? It hasn’t always been so. It’s because employers require a degree as a job qualification... and that’s partly the fault of IQ tests. As SovereignMan's Simon Back concludes, it’s not to say that a university education is a waste of time and money (though an electrical engineering degree is probably a better investment than majoring in ‘18th century lesbian studies’). The point is that going to university and racking up $50,000 in debt solely for the sake of obtaining a piece of paper is bad idea. Any investment– especially the one you make in yourself and your education– requires careful thought and planning, you can learn more at www.sovereignacademy.org. In 1971, the US Supreme Court decided a case called Griggs vs. Duke Power Co. The subject was employment requirements. The court ruled that Duke’s tests were too broad and not directly related to the jobs performed, which made them illegal. That left a problem, though. How were employers supposed to evaluate job applicants without illegally discriminating? Second, there are soft skills. Is this person willing to stick with unpleasant assignments to the end? Will he show up on time? Can she work with others? Those soft skills are harder to judge but critically important. They’re also what the Supreme Court made hard to test. College sort of requires those same soft skills. A degree may not give you much useful knowledge, but it shows you have some basic intelligence and literacy. It also shows you will jump through hoops if your organization tells you to. Employers value those qualities. The Griggs case said nothing about educational requirements. Employers remained free to require high school diplomas or college degrees… and the ruling gave them a big incentive to. College degrees are convenient, legal substitutes for the kind of testing employers haven’t been able to use since the 1970s. So apart from whatever you learn in college, merely having the credential became necessary to career success. As a result, everyone in the equation made certain choices. Employers: demand a college degree even for jobs that don’t require college-level skills. Workers: get a college degree even if you must take on debt. Colleges: Raise prices since so many students are begging for degrees. In the Griggs case, the US Supreme Court effectively granted colleges a monopoly. They can discriminate based on a long series of tests that lead to a degree. Employers can’t. Like most monopolies, this one is inefficient. It creates unpayable debt that burdens students. Some of it eventually falls on taxpayers. Not ideal. Methods exist to evaluate prospective workers without requiring college degrees, and without racial or other illegal discrimination. But there’s no incentive to try them when you can just screen out the non-college graduates and accomplish the same thing. Resolving this impasse would help our debt problem and probably our employment problem as well. But the losers would be colleges and educational lenders, so don’t expect them to cooperate, unless someone forces them to.